My brother John -- he was a pig. Or perhaps a cow. Bring me his head! I sent a friend over to check out SuperCompare just last night! i've been debating with myself whether to start a new blogging category - The Compare Foods Find of the Week. Now i know i don't have to. Did you want any miembre de res to go with that cabeza? Here's another Compare blog from the new "Life in Durham, One Meal at a Time". 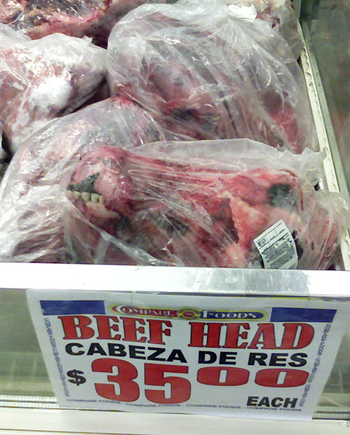 This is the first time that I saw a Beef head on a grocery. I thought those heads can be found on wet markets. Thank you for sharing your post. I love it. Great post. We own a Oval Mirrors ecommerce site are always great content we can share with our customers. Wow! It's a real beef head. Best for bulalo. I'm actually like this website you've posted. very interesting post, a subject that everyone should read thank you for the information. A better package would be more attractive.